Image after Petr Exner's Vexilologický Lexikon prapory obcí ČR (2001) - Hvězdonice, Benešov district, Central Bohemian region - adopted 27 Jun 2001. Flag and Coat of Arms of Rataje are at this webpage (click on images for a better view). The flag on Exner's pages is without the central white linden three-leaves. 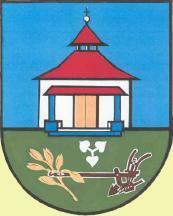 The three-leaves are also present on the flag and Coat of Arms of Chotýšany.